When one does a careful evaluation of the teachings of Emergent leaders, such as Doug Pagitt, Rob Bell, and Brian McLaren, it becomes apparent that they do not believe that Heaven, as described in the Bible, actually exists. Even clearer is their denunciation against the notion of a literal Hell. Their focus is only on the "here-and-now" existence of this life and experiencing the "journey" and "conversations" it presents. "God's going to judge the life and repair and restore and heal the life of everybody in the same way." "For many Christians, their faith is primarily about what happens to people after they die. That distracts them from seeking justice and living in a compassionate way while we're still alive in this life. We need to go back and take another look at Jesus' teachings about hell. For so many people, the conventional teaching about hell makes God seem vicious. That's not something we should let stand." "When people use the word hell, what do they mean? They mean a place, an event, a situation absent of how God desires things to be. Famine, debt, oppression, loneliness, despair, death, slaughter - they are all hell on earth." In an interview discussing their 2009 book, Jesus Wants to Save Christians: A Manifesto for the Church in Exile, Bell and co-author Don Golden say that the Church in America is in exile today. Bell and Golden say that by participating in our culture (they call America an "empire") and by supporting our government/military system and by using oil, we are "oppressors" and create suffering for others. They conveniently ignore the fact that America, in particular the Christians in her, have done more to spread the Gospel of Jesus Christ than any other nation in history - hands down! But in emergent/leftist thought, anything smelling like capitalism must be shunned (except for enjoying the many benefits life in the USA offers). This is nothing less than 1960's, counter-culture, hippie liberalism now being referred to as "Evangelical Christianity!" One might wonder how a nice evangelical kid from Wheaton ended up as perhaps the most popular leader in the heretical Emergent Church. Bell and his wife, Kristen, say that their Christian world became constricting - in Kristen's words, "black and white...." And how did the Bells find their way out of the black-and-white world where they had been so successful and so dissatisfied? 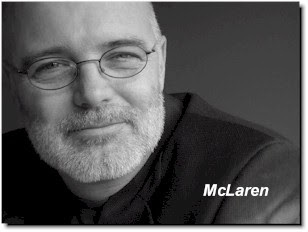 "Our lifeboat," Kristen says, "was A New Kind of Christian by Brian McLaren." If you wish the same fate that has befallen the Bells, all one has to do is abandon the teachings of God's inerrant Word and adopt what McLaren, Pagitt (and now Rob Bell) are selling. How much documentation will we have to produce and how many more reasons will be needed for postmoderns with any scrap of biblical understanding to come to their senses and realize that Emergent Christianity isn't really Christianity at all? Instead, it is cultic, deceptive and eternally damning.